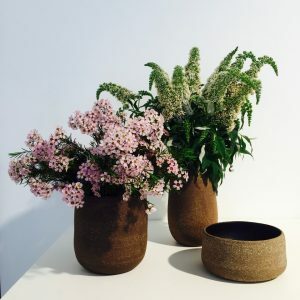 Her latest exhibition, at the Annette Larkin Fine Art gallery in Sydney’s Paddington, continues her Sweet Nature project and reveals her finesse in forming gritty Australian terracotta stoneware into elemental containers which might be used as plant pots, beehives, bowls, platters, vases or display objects. The graceful forms and grainy surfaces of some of her bowls and platters are further contrasted by thick applications of an opaque, black, low-sheen glaze; producing a raw, minimal aesthetic which echoes precedents from 1960s-70s studio potters in Japan, Britain and Sweden. These works are stamped with the number 8 as a maker’s mark; representing infinity and good fortune. As one of three founder-directors of the Dinosaur Designs atelier (until 2010), she was inspired by the sculptural forms of early and mid-20th century European minimalist artists, including Matisse, Brancusi, Morandi and Arp—and their influences still seem evident in her new medium. 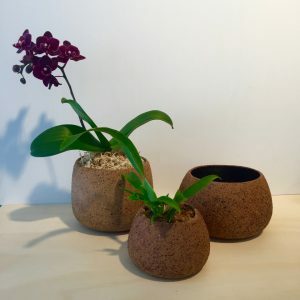 Following earlier experiments with earthenware, carved pumice and sandstone, and hand-blown glass, these recent wheel-thrown containers place her as a significant new protagonist evolving Australia’s history of ceramic arts. She offers today’s collectors rare intuition, authenticity—and skilful, organic imprecision—in her elegant homages to Nature. Liane Rossler’s Sweet Nature exhibition runs 22 November–17 December 2016 at Annette Larkin Fine Art, 4/8 Soudan Lane, Paddington NSW 2021.